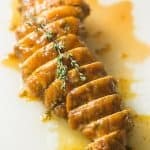 4 ingredient Pumpkin Butter & Thyme Pork Tenderloin – Seared pork tenderloin topped with a pumpkin butter and thyme sauce, then roasted in the oven. A healthy and delicious 30 minute dinner recipe that is paleo, gluten free, dairy free and refined sugar free. For the past year or so I have become a huge fan of pork. Rather than cooking my usual chicken or fish dinner recipe, I can add more meat variety by making pork tenderloin or pork chops. 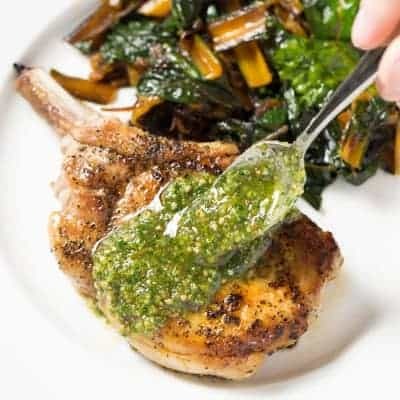 Pork is very inexpensive, high in protein, and versatile like chicken so I can jazz it up with all sorts of sauces and marinades. 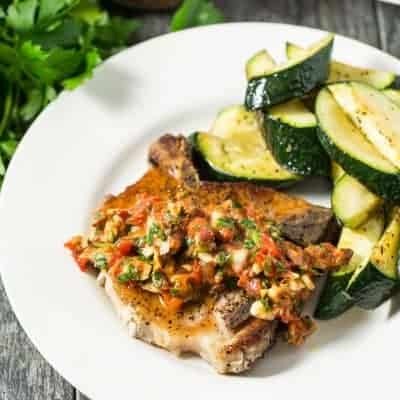 I’ve made a rosemary honey mustard pork tenderloin, pork chops with a chunky red pepper sauce, and my previous favorite pork chops with orange pecan pesto. 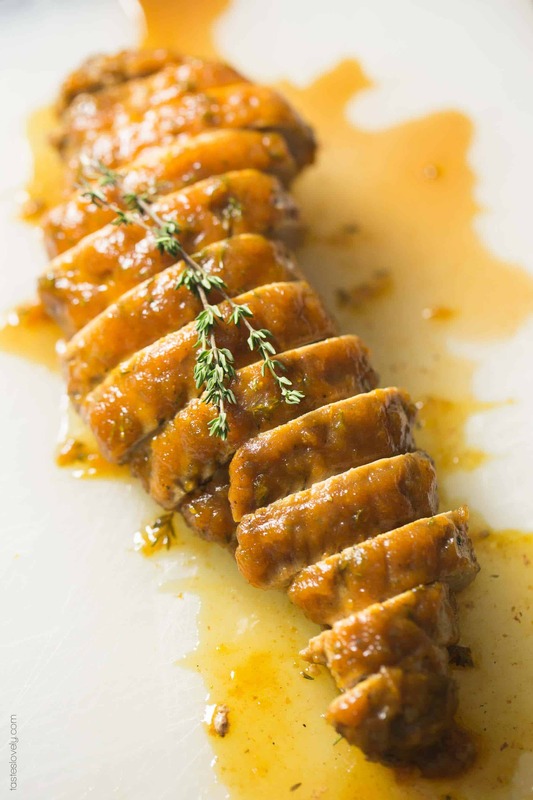 But since it has gotten cold out, I have loved this pumpkin butter & thyme pork tenderloin. It is our new family favorite I swear I am making it once a week. The tenderloin is seared in a cast iron skillet to get a golden, crusty exterior. Then topped with the most delicious (and easiest!) pumpkin butter and thyme sauce. Then you pop it in the oven to finish roasting. Dinner is ready in 30 minutes with only 10 minutes of prep thyme, then oven does all the rest. I like to roast some potatoes and brussels sprouts in the oven at the same time to serve with it. So quick and easy, and barely any clean up. The pork tenderloin comes out juicy and packed with flavor from the pumpkin butter and thyme sauce. To make sure it is cooked to the perfect temperature of 145 degrees, I highly recommend getting an instant read thermometer. There is nothing worse than dry, overcooked pork. Well, except maybe raw, undercooked pork. So definitely get a thermometer if you don’t have one. It is one of my kitchen must haves! You can use store bought pumpkin butter to make this recipe even easier (Trader Joe’s has a great one! ), but to keep this healthier and refined sugar free, I use my homemade paleo pumpkin butter, which is sweetened with honey. I’m eating enough sweets this time of year (I’m talking about you Brownie Cookies), so I try and make healthier choices whenever possible. 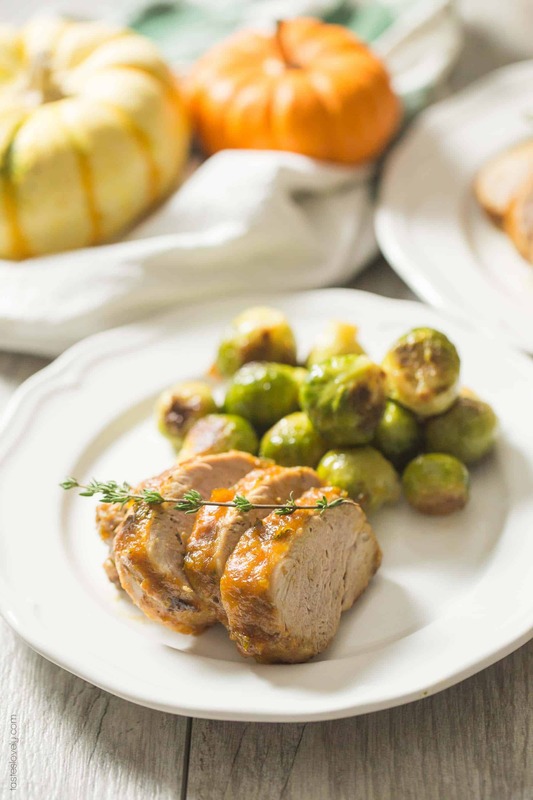 The flavors of this pumpkin butter & thyme pork tenderloin is perfect for cold weather nights. Pumpkin and warm spices and fresh thyme. And healthy too! Gluten free and dairy free, and if you use my homemade pumpkin butter it is also paleo and refined sugar free. Preheat oven to 425 degrees with the rack in the middle. Preheat a cast iron skillet over medium high heat. 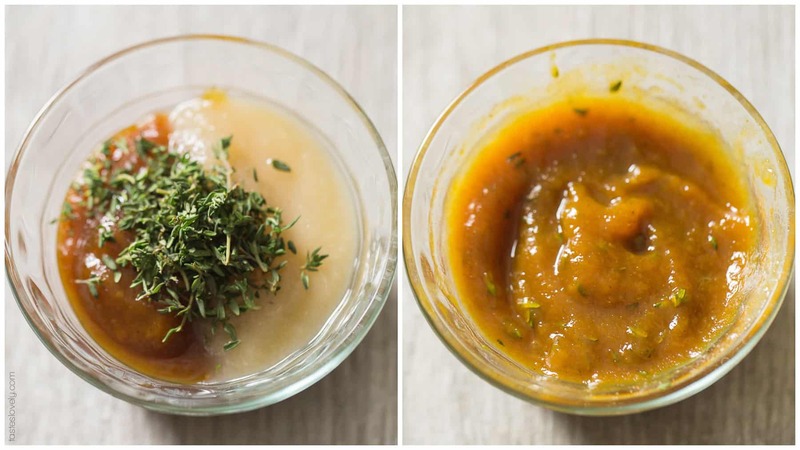 In a small bowl, combine the pumpkin butter, apple sauce and thyme. Stir to combine, set aside. Pat the pork tenderloin dry with a paper towel and season generously with salt and pepper on all sides. When the skillet is hot, add the olive oil and sear the pork loin on all sides until golden brown, about 2 minutes per side. Top with the pumpkin butter & thyme mixture and spread evenly to coat the top of pork tenderloin. 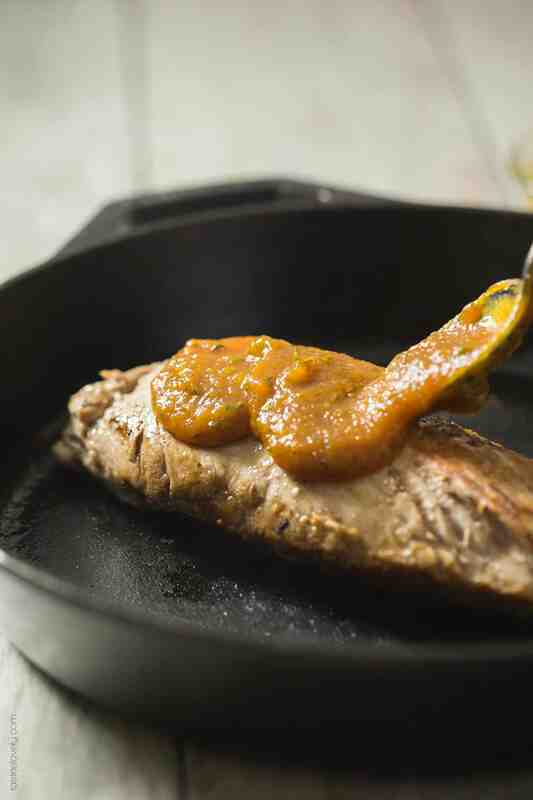 Transfer the pork tenderloin in the cast iron skillet to the oven to finish cooking. Cook until the meat is 145 degrees on an instant read thermometer, about 15 minutes, depending on the thickness of your pork tenderloin. Remove the cast iron skillet from the oven, transfer the pork tenderloin to a cutting board and allow to rest for a few minutes. Slice the pork loin into ½” thick slices. Serve warm. Leftovers will keep refrigerated in an airtight container for 3 days. 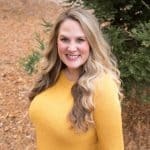 My husband loves pork, but I always struggle with new ways to prepare it! Thus, we either don’t end up having pork, or have it prepared the same ‘ole boring ways. This pumpkin butter version looks SO good, Natalie! I’m loving the thyme in here, too…one of my favorite herbs to cook with! I’ll eat almost anything if it’s slathered in pumpkin butter! I love this idea and I’m pretty sure my husband would go crazy for it! LOVE! Pork tenderloin is also a favorite! I’ve done all kinds of chutneys, fruit glazes, and mustard sauces, but I’ve never tried pumpkin butter. Sounds divine with the thyme! Thanks for the inspiration! I have made this many times. It is wonderful.